What's your ratio of Bible reading to spiritual book reading and how do you find time for both? Will you share your testimony? As sister-in-law’s, how did your friendship develop? Did your friendship come naturally and how much did you work for it in the beginning? 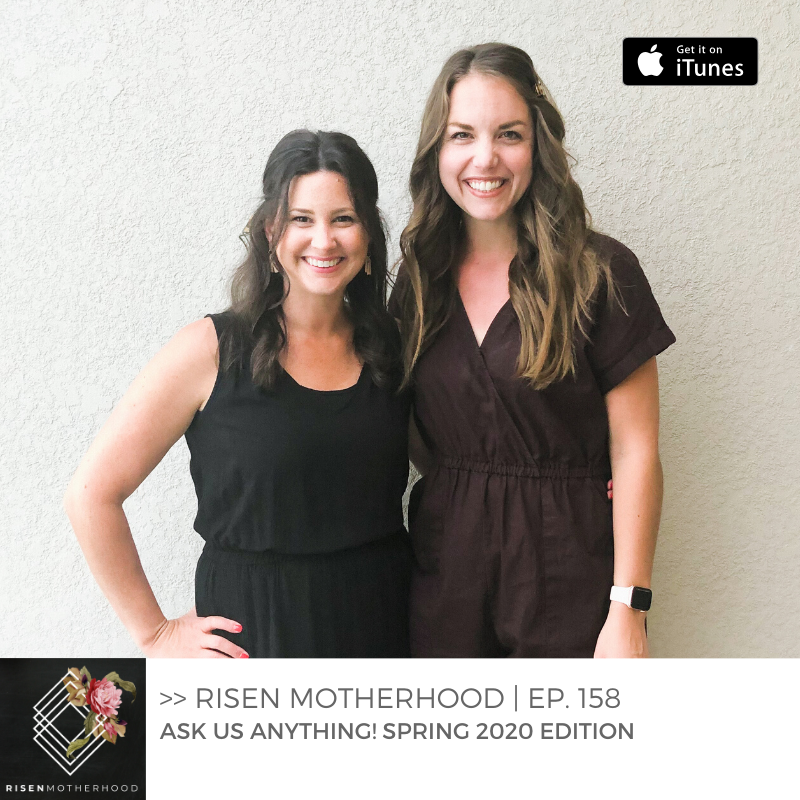 How do you currently try to balance ministry/work life (Risen Motherhood) with everything else (home life, church ministry, etc.)? Do you live close to each other? How do you record it together? Do you do a bunch at once or all separately? How do you choose your topics? Do you/how do you get paid for RM? What things (good or bad) did/do you get hung up on pertaining to raising little ones? Things that you obsess over or try with all your might to control eg. sleep, food, hygiene. And more importantly, how do you give those things over to God? What's the best spiritual & most practical advice you've received during your time as a mom? How do you do more than just survive with multiple kiddos? How to cope with little sleep: Pregnancy Insomnia, newborn stage, temporary illnesses, etc. How your marriages have weathered with recent health issues of your kids? What do fights and reconciliation look like? How do you avoid husband getting “leftovers” because you are so tired by the time he comes home? Emily and Laura on "Dad Tired"
How do you balance housework with your husband? Do you keep your kids with you on Sunday or send them to nursery? How do you balance receiving from the Lord and caring for children? How much should I sacrifice my child’s needs in service to the church compared to my own growth? Ep. 65: Finding Your Tribe: Momma, Who is Your Primary Community? How do you balance housework and playing with your kids? Do you have resources for training up toddlers or providing general discipline.